Dr. BBQ, Ray Lampe, will demo this recipe on Saturday and Sunday of the show on the Eagle Room patio. These cupcakes, which are kind of like tasty breadless meat loaf sandwiches, can be served warm or at room temperature and make great tailgate food. You can eat a cupcake with one hand and hold your drink in the other. I use jalapeño jelly from the supermarket for this recipe, but there are plenty of fiery exotic pepper jellies available, so use what you like and can find locally. 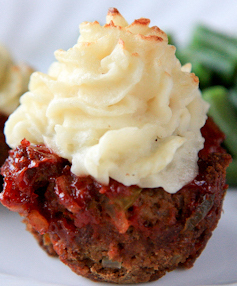 To make these look more like cupcakes, top them with mashed potatoes. Prepare the EGG to cook indirect at 375°F. Using your hands, break up the beef so it is loose, capturing it in a large bowl. Sprinkle the meat with the salt, pepper, onion, and chile, distributing them evenly. Pour the eggs over the top and add 2 tablespoons of the pepper jelly. Using your hands, mix until all of the ingredients are evenly incorporated. Sprinkle the bread crumbs over the mixture and again mix with your hands until fully blended. Spray a medium muffin pan with vegetable cooking spray. Divide the meat mixture into 6 equal portions and shape each portion into a ball. Shape 1 ball so it will fit snuggly in a muffin cup, place it in a prepared cup, and press gently to flatten the top. Repeat with the remaining 5 balls. Place the pan in the EGG on the cooking grid, close the lid, and cook for 20 minutes, or until the cupcakes are firm enough to remove from the pan. Remove the muffin pan from the EGG and invert the pan to dump the cupcakes out onto a work surface. Return the cupcakes, right side up, to the EGG grid, close the lid, and continue cooking for 5 minutes more. In a small bowl, whisk together the ketchup and the remaining 1/2 cup jelly. Spoon the jelly mixture over the cupcakes, close the lid, and cook for 15 to 20 minutes, until the glaze is well set and the cupcakes have reached an internal temperature of 160°F. Transfer the cupcakes to a platter and let rest for at least 5 minutes before serving. Serve warm or at room temperature.